Britain is being urged to help set up an international "contact group" to co-ordinate western and Arab policy towards the crisis in Syria, where President Bashar al-Assad is defying mounting outrage over the violent suppression of mass unrest. And guess who is doing the urging? It has emerged that King Abdullah of Jordan raised the idea, borrowed from the recent Libyan uprising, in talks with David Cameron on Tuesday. Do you want to tell me that this Hashemite Pinnochio came up with this brilliant idea all by himself? Seriously, I want the killing to stop in Syria, but getting the half-English king of Jordan who can't wipe his chin without permission, is probably up there with using the Arab League as the front for international pressure on the Syrian regime. 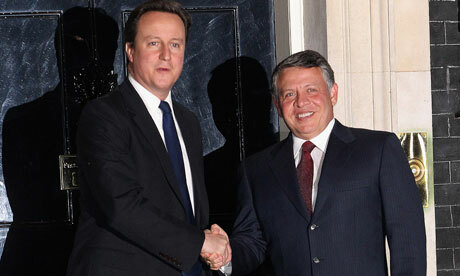 I can almost see the puppet strings moving Abdullah's hands as he shakes hands with David Cameron. If the situation in Syria wasn't so tragic and the Assad regime not so stupid, I would have a different position, but right now Syrians would probably shake hands with the devil.